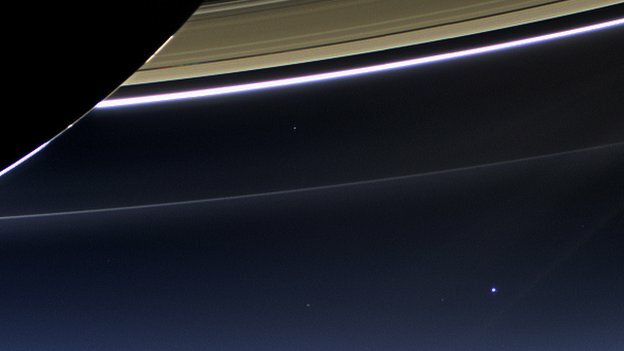 Nasa has released photos of the Earth and Moon taken by a spacecraft orbiting Saturn – nearly a billion miles away. Scientists wanted to pay homage to the “Pale Blue Dot” image captured by the Voyager 1 probe in 1990. This was the first time people knew in advance that their long distance picture was being taken. As part of the event launched by Nasa, people were asked to wave in what Carolyn Porco, who leads Cassini’s camera team, described as an “interplanetary cosmic photo session”. “It thrills me no end that people all over the world took a break from their normal activities to go outside and celebrate the interplanetary salute between robot and maker that these images represent,” said Dr Porco, from the Space Science Institute in Boulder, Colorado. The wide-angle image is part of a larger mosaic – or multi-image portrait – that imaging scientists are putting together of the entire Saturn system. Pictures of Earth from the outer Solar System are rare because, from that distance, Earth is very close to the bright Sun. Just as a person can damage their retina by looking directly at the Sun, a camera’s sensitive detectors can be damaged by the bright rays. These images were taken when the sun had moved behind the planet Saturn from the spacecraft’s point of view, blocking out most of the light.